Once Jeremy left for school, I set about trying to come up with a repertoire of meals that made excellent leftovers, so I could cook for myself once and eat for a week. I’m fussy about leftovers, though (no surprise there! ), and meats in particular are difficult for me, because they often seem to get rubbery when reheated, and I don’t like them cold. So believe it or not, I ended up looking a lot more frequently to vegetable dishes, which reheat beautifully most of the time. I also make a lot of soups for just myself, because they last a long time, can be often frozen if necessary, and don’t dirty a lot of dishes. 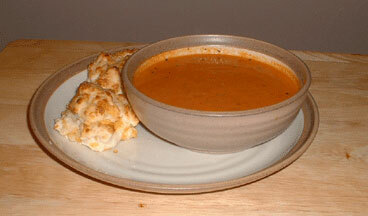 One day last year I was contemplating what to make for dinner that night, and tomato soup popped into my head. I am still not sure why, because I don’t really like tomatoes, and tomato soup always tastes way too acidic to me. But I couldn’t get the thought out of my head, so I started looking into options. What I came up with is a soup that packs a lot of flavor, with a light creamy texture and a mild tomato flavor. It’s now one of my very favorites. I’ve made this soup lots of times now and it is very versatile. I’ve added some tomato paste to the onions for additional depth of flavor, if I have some to hand, and I love to serve it with cheese biscuits, though of course your classic grilled cheese would not be amiss. Melt the butter over medium heat in a large soup pot, and saute onions until translucent. I sometimes add minced shallot here if I have some on hand. Add chicken broth and herbs, and turn up heat to high; boil until broth is reduced by half. Add tomatoes and juice, and simmer over medium heat for 15 minutes. Remove pot from the heat and use an immersion blender to puree to desired smoothness. Place back on the heat, and add baking soda; stir until the fizzing stops. (This cuts some of the acidity of the tomatoes, and is kinda fun to watch besides.) Stir in cream or half-and-half, and heat gently until warmed through. Adjust seasonings to taste, and eat with braised cabbage and buttered toast. Mmmmm. Update 2/19/10: Served this tonight with homemade pita chips. I used very gelatinous homemade stock, so I skipped the broth reduction phase, and I was out of tomato juice so I just omitted it. I also added two small pieces of Parmesan rind that were floating around in the cheese drawer. The pita chips were made with leftover homemade pitas, cut into eighths, brushed with a combination of butter and olive oil, and sprinkled with salt, pepper, and garlic powder; then they were baked at 375F for about 12 minutes, until crisp.